Behind me there is an image of "Dondi" a fearless NYC graffiti artist who was captured by Martha Cooper in the 1980s. Visiting a part of Martin Wong's extensive and vibrant graffiti art collection at the Museum of The City of New York in Harlem, not only brought me back to the 80s when I came to New York City for the first time to visit with my parents, but it also gave me a deep view of the richness of graffiti and the amazing artists who started a movement that has now become unstoppable. Undoubtedly, street art and graffiti are not interchangeable terms like I explained in this post but in their evolution, the lines between both have been blurred creating a massive amount of works that nowadays occupy a very important place in contemporary art and in art history. Graffiti art has been on a rise for more than three decades, transitioning with bluntness and strength from the streets of Washington Heights and Harlem, to the walls of the most recognized galleries and auction houses in the world. 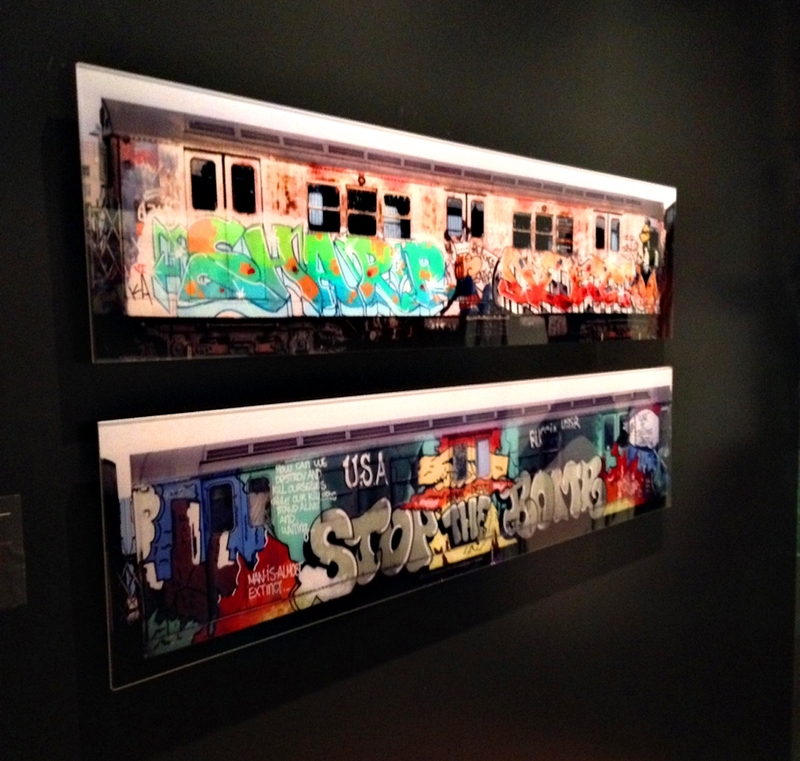 Henry Chalfant's photograph depicting a train of the MTA Subway System completely covered in graffiti. Wong grew up in the streets of Chinatown in San Francisco and moved to New York in 1988, settling in the Lower East Side and becoming a staple of the “Nuyorican” cultural movement. He became an avid collector of graffiti art and an accomplished artist himself. His own work is in the permanent collection of the Metropolitan Museum of Art, the Whitney Museum in New York City and the Art Institute of Chicago among others. I love the texture on these wood panels. The one on top is by Futura 2000 and the one under is by Zephyr. One of the things that moved me the most about this show was seeing Wong’s point of view from thirty years ago and finding the connection with all of these artists who later became graffiti stars in their own right. Clearly, he was collecting with a meaningful purpose without spending an outrageous amount of money – his combination of “buying what you love but be savvy about it” played an important role in making his graffiti collection perhaps one the largest in the world. I loved the creativity of this installations with jackets that were created for Wong; the one on the left was designed by SHARP, the one in the middle by Delta 2 and the one in the right by Caine One. This was a piece created by DAZE for this particular show to celebrate Martin's legacy. It's called "Reflections on Times Square, 2013" and it was finished in six hours on the terrace of the museum. Later in his life, Martin generously donated his collection to the Museum of the City of New York understanding that his passion had a lot more reach than if the pieces were to be sold separately or if the collection were to remain private. Three of the Keith Haring pieces in Wong's collection. It's so cool to see artworks like these that still feel so gritty and so New York. I have always loved Keith's drawings. He was such an amazing draftsman, consistent and utterly recognizable. Another remarkable aspect is that the collection comprises a variety of works that are integrated within a very specific movement and time period, but that freely range from mixed media on canvas to sketches on notebooks to denim jackets whose backs have been embellished with colorful designs by some of the most recognized graffiti artists in the world. The show includes pieces by Futura 2000, Lady Pink, Keith Haring, Lee Quiñones, Rammellzee and Crash. This was one of my favorite pieces. A collection of tags from a collective of graffiti artists from the 1980s called "Wicked Gary"
This exhibition is a must for collectors and art lovers who can think creatively, challenge what others believe and laugh at what naysayers of the 1970s and 1980s thought when they said that graffiti meant nothing more than vandalism and that as an art form was never going anywhere. I could not leave without stopping by the gift shop which has a selection of items, clothing and limited edition prints that perfectly fit the exhibition and can be a wonderful addition to any collection. Below are my two favorite items. The Keith Haring Coloring Book which must be in its 100th reprint, but it is still wonderful and the mugs created especially to commemorate the show.